The ST-10 offers new capabilities and new level of refinement. Its new, light weight polymer bins are translucent and allow an additional visual indicator of the bin level along with standard bin level sensors. Are you interested in a quote or demonstration of the ST-10? Please fill out the form below and one of our Territory Managers will be in touch shortly. 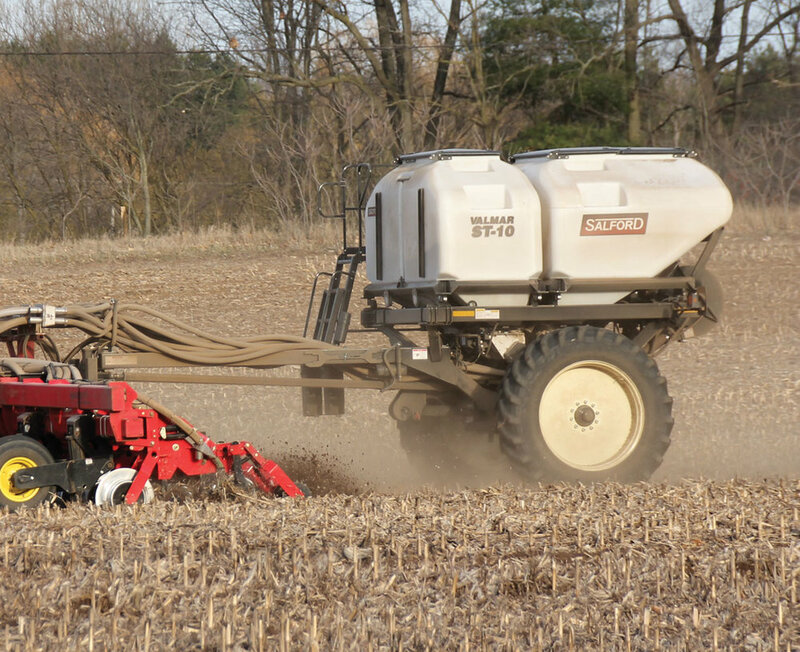 Salford is expanding its range of steerable carts and fertilizer systems for 2017 with the addition of the Pathfinder 10-Ton cart and the ST-10 dual product applicator. These will serve as flagship products in a range that already includes the successful Pathfinder 8-Ton cart along with the ST-6 single product and ST-8 dual product applicators. ST-10 models can carry two separate commodities with their 60/40 split tanks. Blending is done right at the meter, rather than in the air line. This ensures the most accurate blend possible. The ST-10 has 2 separate tanks. ST-Series applicators use hydraulically driven systems. Factory optional ECU's allow for simple straight rate application or ISOBUS compatible variable rate application. ST-Series applicators can be fitted with 8, 12, 16, 18, 20 and 24 metering runs and the primary air delivery lines can be split downstream to deliver up to 48 rows of product. ST-Series applicators use peg roller meters, which excel at metering seed or fertilizer. Compared to auger metering these rollers offer greater accuracy, are less susceptible to plugging, are easier to change and do not grind product. Peg rollers are equipped with brushes for self cleaning. Low rate rollers available for cover crop and micro nutrients. A hopper slide gate and removable bottom makes emptying tanks quick and easy and meters simple to remove. The ST-10 offers new capabilities and new level of refinement. Its new, light weight polymer bins are translucent and allow an additional visual indicator of the bin level along with standard bin level sensors. The overall capacity of 10-tons of fertilizer is split between a forward 4-Ton tanks and rear 6-Ton tank – both of which can be scaled individually. Large, easy to open lids and sloped sides makes filling with tender trucks simple and efficient. Snap-in meter rollers, spring-loaded gates and a full-width removable panel below the air manifold take the hassle out of unloading. The meter rollers themselves are now an accurate pegged style rollers similar to Salford’s air seeding systems. The new rollers offer a wider range of application rates and are available with standard and low rate peg sizes. The new 4-section metering system retains the reliable, low maintenance and user-friendly aspects of the Valmar-designed ST6 and ST8 with the added ability to turn up to 4-sections per product on or off based on application maps. An optional ISOBUS control system allows connectivity to ISOBUS compliant cab consoles*. Mechanical engagement of the meters is achieved via electric clutches; a proven approach that has already seen extensive use on other Salford Valmar products. *Options must be requested at order. Both metering systems deliver product to a single funnel that drops in to a common venturi air stream for the highest possible blending accuracy and efficiency. There is no need to run two sets of air lines to the application knife as all the blending happens right at the metering system. The air manifold and funnels are only connected to one metering system to maintain scale reading integrity. The number of air outlets is determined by the funnel/air manifold assembly, which can be easily changed by simply unbolting it from the metering system. Updating from a 12-outlet to 16-outlet system can be achieved in a matter of minutes. A 20” fan driven by a 12cc hydraulic motor spins at up to 5900 rpm to provide plenty of air at high rates. By maintaining a set pressure in the air plenum behind the venturi manifold, a constant, reliable airflow can be achieved regardless of the number of outlets. The 5-link mechanical steering uses the Ackerman steering principal by which the inner wheel turns more sharply than the outer wheel. This combined with a long hitch allows the cart to mimic the travel of the leading implement with a higher degree of precision. The high clearance axle allows the cart to follow application toolbars in standing crop without causing damage to the rows. Large diameter tires allow for row-crop tracking while minimizing compaction. A tow hitch can be added for towing anhydrous ammonia tanks as well.